Unfortunately, that means I will be extremely busy during the next week. This weekend there is graduation and Father’s Day and a big fancy black tie dinner where my brother is getting honored, and then Son and I are moving to be closer to his work. These are all sorts of good and happy things, but the downside of this is that I won’t have the time to make sushi. No time. Whatsoever. So I will be taking a hiatus, but only for a little over a week, I promise. 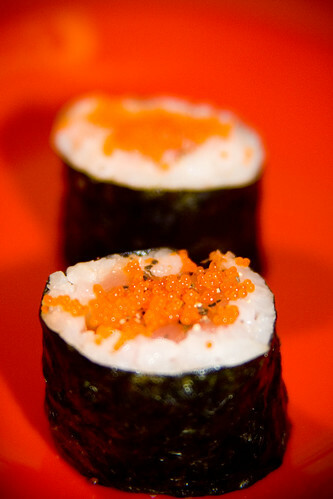 On the morning of June 22nd, I will be back with much more sushi, and perhaps even a restaurant review or two! (Son has promised to take me to get sushi, to celebrate. 🙂 ) I promise. I can’t bear to leave you, my wonderful readers, for too long. As a parting gift, I leave you with the Pepper Tuna Roll. It is simple, true, but often simple can be the most enjoyable. I hope you all enjoy the sushi! I’ll be back in nine days! 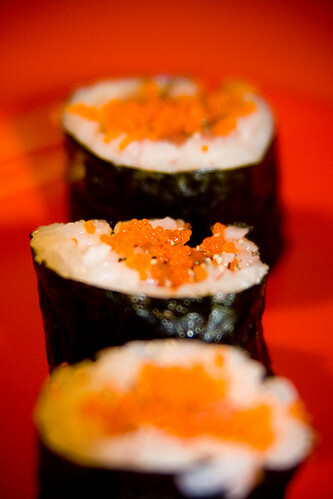 Roll the sushi, using tuna as your filling. 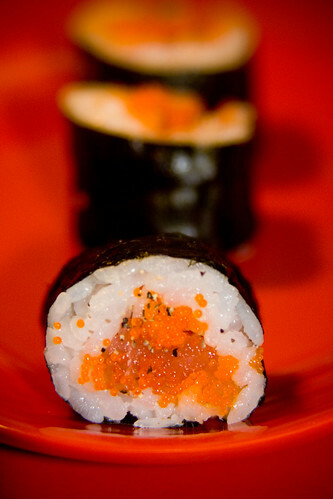 Top each slice with a little mound of tobiko, and then sprinkle ground black pepper on top. Every time I come here, I get a sushi craving so strong I can’t think of anything else! @Rachel: I know how you feel. And every time she posts, it’s freakin’ midnight here. Rachel, Joel, and Bamboo Forest – I’d say sorry, but you know I’m really not. 😉 I’m glad to hear it! Lara – Too bad you can’t find sashimi. Unagi, however, is delicious! Let me know how it turns out! Good. You’ve publicly admitted it now, so I’m going to have to hold you to your word. I’m sure you understand. I made a couple of unagi/avocado rolls, a California roll (with black and white sesame seeds on the outside since I had no tobiko) and a regular roll with fake crab leg, avocado and some dynamite sauce inside. I am STUFFED. The unagi is as tasty as the stuff I get in my regular sushi restaurant. A 10 oz package ($10.99) gave me enough for 3 rolls making it cheaper than the $9.95 the restaurant charges but it’s not that much of a markup for them if you figure out the other operating expenses that price is paying for. Scaling down sushi making for one person is tricky. I figure I can get 4 regular rolls out of 1 cup of uncooked sushi rice. If I make inside out rolls, which take more rice, I can get 2 rolls and have enough rice left over for a couple of nigiri. I really wanted some inari sushi but had no skins on hand. Next trip to the grocery store I’m picking some up. I’m glad you enjoyed it! 🙂 Sounds like you had some fantastic sushi. Allison, it’s so exciting that you’ve graduated college.Congratulations! Enjoy your break, it will give me time to explore and get caught up. I am very new to sushi, (because I have a fear of eating raw fish, too many times of food poisoning in my life) but have recently been to a few sushi places and found some recipes that I loved that had cooked fish and other items that I fell in love with and I discovered that I am crazy for wasabi and fresh ginger. Well, I thought, I know right where to go for new information! Straight to the expert! I’ll be here reading when you get back! I’m sorry it’s taken me so long to get over here. Cheesecake and sushi, too…if only I’d known…. Seriously, my son likes to cook and try new things and we both like sushi. I actually gave him a DVD/sushi making kit for Christmas (DVD, recipe book, and mat). We’ve both been plugging away at life here; so far we’ve only watched the DVD. It’s summer break for him now…we’ll definitely be checking out your site and trying things out! You know what I’ve decided, Allison? You need to take crappier photos. These ones make me hungry.